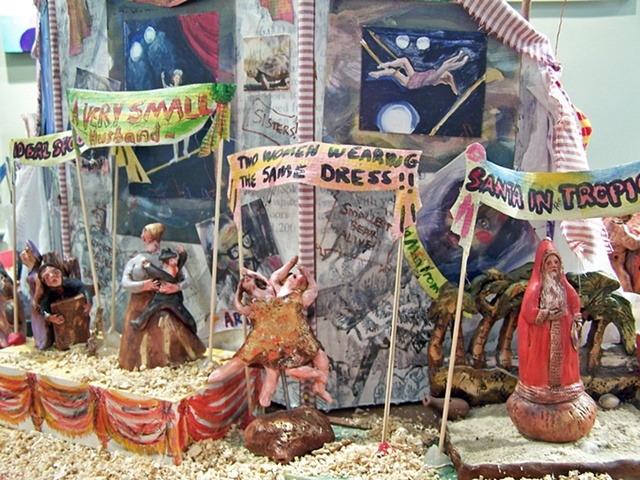 Seven Days Art Review: Circus! an all-media group exhibition. Studio Place Arts, Barre. "The circus is in town! An all-media group show with the simple title Circus! at Studio Place Arts in Barre trumpets the weird and wonderful visual world of the Greatest Show on Earth. ...."
"Delia Robinson commands one of the three rings. Shes the queen of handmade clay whistles, and her Whistle Circus is alive with earthenware creations that would probably enhance the music of a sloppy brass band. Circus wagons, animals, clowns and a guy about to be shot from a cannon are all equipped to emit tunes, anyway. Nearby, a painted audience fills bleachers, and theres an attraction called small dogs. "